The flight from Barcelona to London was only about 1.5 hours. 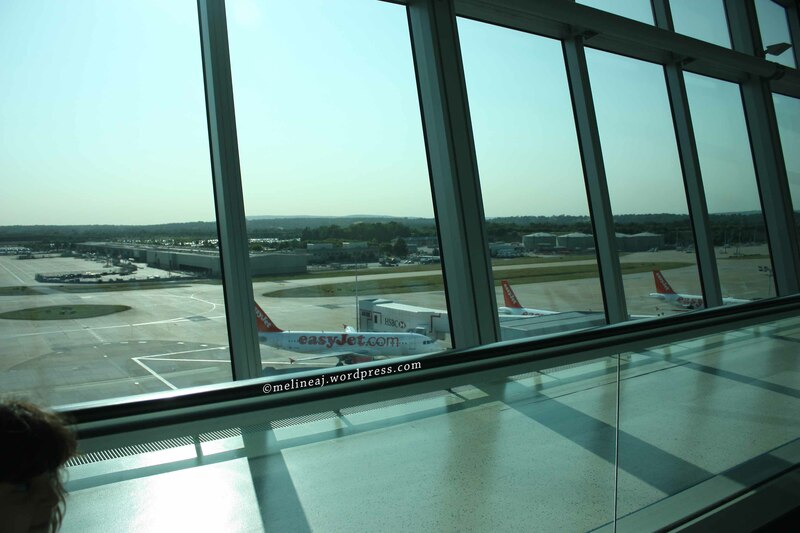 We expected that Easy Jet plane was as small as the Vueling one, but we were wrong! In fact, the seats were comfortable and spacious. We arrived at Gatwick Airport at about 6 pm. We already booked First Capital Connect train ticket online prior to our arrival (£20 for 2 tickets). So, we immediately followed “Train Station” sign as soon as we exit the terminal. Once we were at the ticketing area of the station, we went to the vending machine to pick up our tickets by inserting the credit card that we used to purchase them. However, we were a bit confused on how to find the correct platform for our train, First Capital Connect. This train is an above ground train that gave us the fastest way to reach Elephant & Castle area where we stayed. However, if you stay at Central London, there’s a Gatwick Express train that will take you directly to Victoria station. Note: London has 5 different airports around the city: Heathrow, Gatwick, Stansted, Luton, and London City. Go here to find the transportation from & to each airport. So, for our case going from Gatwick to Elephant & Castle, we took First Capital Connect train at the platform showing ‘Bedford’ as its direction (platform 4). Then we got off at Blackfriars Station platform 1 and had to change to another train to platform 2 (unfortunately, there was no clear sign which platform we should wait). We later found out that we could actually take any train as long as it stops at Elephant & Castle. The lingo for British train stops is ‘calling at.’ The total trip from the airport to Elephant & Castle station was about an hour. Once we arrived at the station, our host already waited at the station to walk with us to his apartment (we booked a room via Airbnb). Elephant & Castle area seemed a bit dingy and quiet. For our 5 days stay, we felt safe walking around even at late night. Our host’s apartment was located on the 3rd floor of a British-row apartment – just like in movies! I was super excited hahahah…. Once we entered the apartment, we were kinda surprised that the apartment was so tiny! However, our room was big enough for me and my hubby. Oh and the bed was the BEST bed we ever slept during our trip! This made us too lazy to wake up in the morning hahaha…. 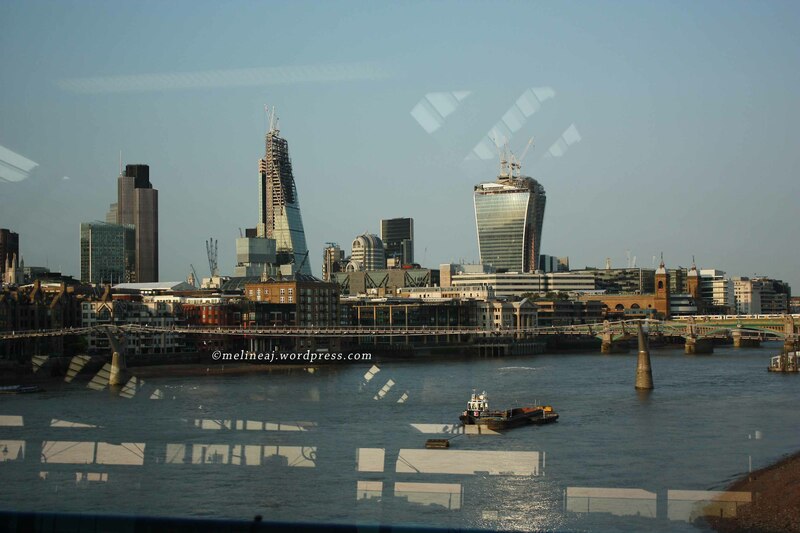 At about 8 pm, we walked toward London Bridge RAIL station to buy Travelcard. We could take tube to go there, but then we also wanted to see London at night. The walk wasn’t that bad, from Elephant & Castle to London Bridge, it was about 20-30 minutes. There are many options for London Metro Pass: Oyster Card, Travelcard, and London Pass. We chose to buy 7 days Travelcard zone 1-2 with 2-4-1 promo for £39 each person. In order to get the 2-4-1 promo, you need to buy the Travelcard from a RAILWAY STATION in London: Paddington, Euston, St Pancras, Kings Cross, Liverpool Street, London Bridge, Charing Cross, Waterloo or Victoria (ref). If you buy a Travelcard from airport, underground station, and online, it is NOT valid for 2-4-1 promo!!!! The 7 days Travelcard are a photo card, so you must bring a passport (4×6) photo so it can be attached to the card. Once we got our Travelcard ready, the cashier handed us a booklet containing all coupons for certain tourists attractions. In order to redeem the 2-4-1 offer, we had to write down our information at the blank form at the very back and then gave the form & showed our Travelcard to the cashier. The cashier checked our pictures to make sure that we were the true owner of the pass. The Travelcard is valid for London Underground, London Buses, National Rail Trains, The Docklands Light Railway, and Tramlink as long as you buy the designated zone. Also, it will give you a 33% discount on London River Services. As a general rule if you are travelling 3 or more journeys a day in any 5 days within a 7 day period a 7 day Travelcard works out cheaper than an Oyster. Otherwise an Oyster on a Pay As You Go basis is cheaper. If you are staying longer than a week and are travelling frequently then a Travelcard is probably going to be cheaper, if you are just an occasional traveller Oyster on a Pay As You Go basis. You can load Travelcards onto an Oyster Card and switch between Oyster Pay As You Go and Travelcard as your travel patterns change. If you have children under 18 year of age then your decision will probably be driven by access to child fares. Travelcards often give you access to child rates much easier than Oyster for short duration visits – see the getting child rates section further down page. The 3rd alternative for tourists is London Pass. The London Pass itself covers the entrance fee for major London attractions. You can buy a combined London Pass with Travel that takes care all your attraction fee as well as your transportation fee around London (basically you’ll get 7 days Travelcard zone 1-6 for this option). However, the prices are expensive! One adult 6 days London Pass is £102, while the London Pass with Travel is £156 (ref)! If you do travel outside London, this might worth it. Since most of London attractions are within zone 1-2 and most of the museums are free, this is redundant for us. That’s why we opted for Travelcard with 2 for 1 promo that gave us the most saving for the value of the card. Once we got our Travelcard, we went back to the apartment by tube. 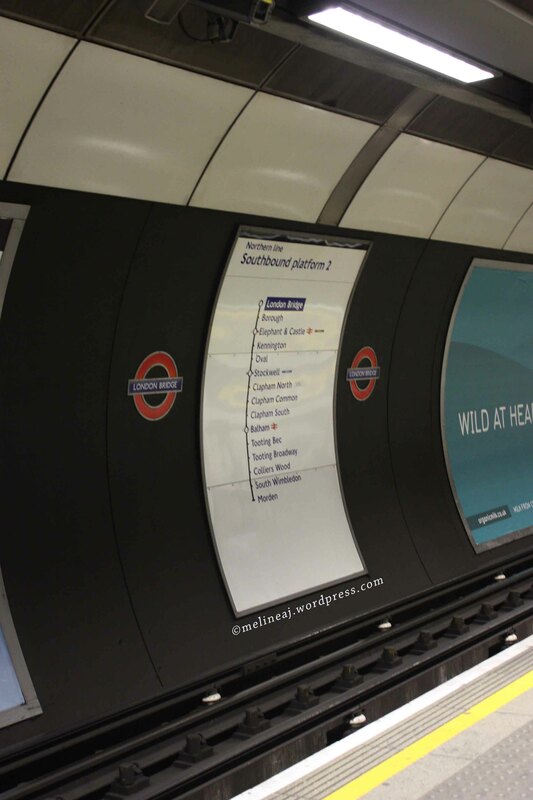 Silently, I was super excited to ride the tube – although I am used to ride metro/ subway in different cities. For me, London tube was kinda special since the station is shaped like a circular tunnel (ref). Also, the train itself has a low ceiling and a long narrow path – feeling like inside a tube! In my opinion, London has the most sophisticated underground transportation among other cities I’ve visited. The twelve tube lines along with bus and boat lines (map) are very convenient; thus, it’s so easy to get around the city. The signs and directions are clear and you won’t miss tube logo, “the roundel” (a red circle crossed by a horizontal blue bar), to find the nearest station. Inside most of the stations, they have shops, such as Mark & Spencer, that sell sandwiches, microwaveable food, and snacks. We ended up buying sandwiches as our dinner that night. I directly went to bed after eating the sandwich since I was super excited to begin my exploration around London the following day!